Experian Hitwise, a gl obal information sevice provider with clients in more than 90 countries, announced on Twitter that social network Pinterest has become a top 30 website in the U.S., and that top 5 downstream sites from Pinterest were Facebook, Google, Youtube, Etsy & Yahoo. Pinterest, a virtual pinboard, organized by the principle of mood boards, is a social network that is growing extremely fast in both users and traffic. There are studies saying that this network drives more referral traffic than Twitter and some articles mentioning even that Pinterest drives more referral traffic than Google Plus, LinkedIn and YouTube combined. If this is the case, anyone can say by looking at their analytics (for a blog of mine, I must admit, Facebook, StumbleUpon and Twitter remain main traffic sources). Pinterest became a top 30 website in the US in terms of total page views, and its total US page views increased 21% in February 12. But who has the most to gain from all of this traffic? It seems that the answer is simple. According to Hitwise, in February top 5 downstream sites from Pinterest were Facebook, Google, Youtube, Etsy & Yahoo. Other important names in the top are Gmail, ranked 7, Martha Stewart – 8th place, followed by Polyvore, Flickr, eBay, www.sixsistersstuff.com, Twitter, Tumblr and Apartment Therapy. As you can easily notice, there are some surprising names in the list – Gmail and Twitter were for me! – some search engines like Bing, Yahoo Search, and some websites like Better Homes and Gardens (guilty as charged, for I too repinned some photos in my boards! ), Martha Stewart and www.sixsistersstuff.com. 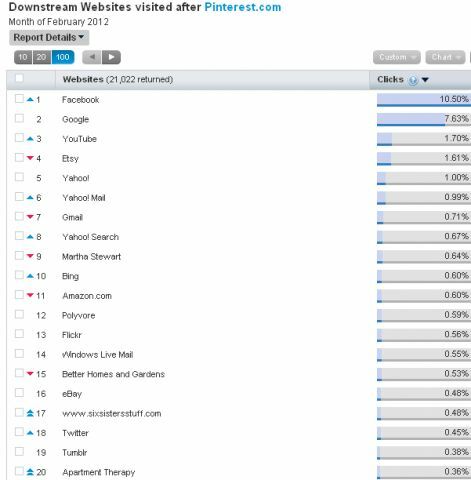 I am not surprised by the fact that photo sites like Tumblr or famous Amazon.com appear in the list. You could also compare this list with the one with sources of content for Pinterest, where top 5 is made up of Google, Etsy, Amazon, Tumblr, Polyvore.